Dogs will go wild for PRO PAC® Beef Flavored Woof 'em Down Sticks™. That's because the juicy meaty flavor of beef is sealed in every mouth-watering bite. 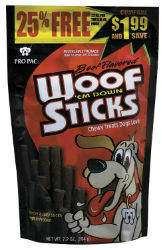 Your dog's senses will go wild when you open the bag and treat him to Beef Flavored Woof 'em Down Sticks™! Porcine Meal, Wheat Flour, Chicken Meal, Soy Flour, Corn Flour, Sugar, Chicken Fat (preserved with mixed Tocopherols), Beef Flavor, Propylene Glycol, Natural Liquid Smoke Flavor, Salt, Garlic, BHA (a preservative), Added Color (Caramel, Titanium Dioxide, FD&C Red 40, FD&C Yellow 5, FD&C Blue 1).